Charlotte's newest buzz band hasn't done a single live show yet — it will remedy that on May 3 at Crown Station Pub — but its roster looks awfully familiar. Maybe because every Harry Hunter member is a veteran of local cult bands. Bassist Jermaine "Maine" Bracey and drummer Charles Ovett hail from noise-rock staple Battle Beast — and Ovett also flies solo as the sometimes-masked, art-rock outfit Death Rides a Horse. 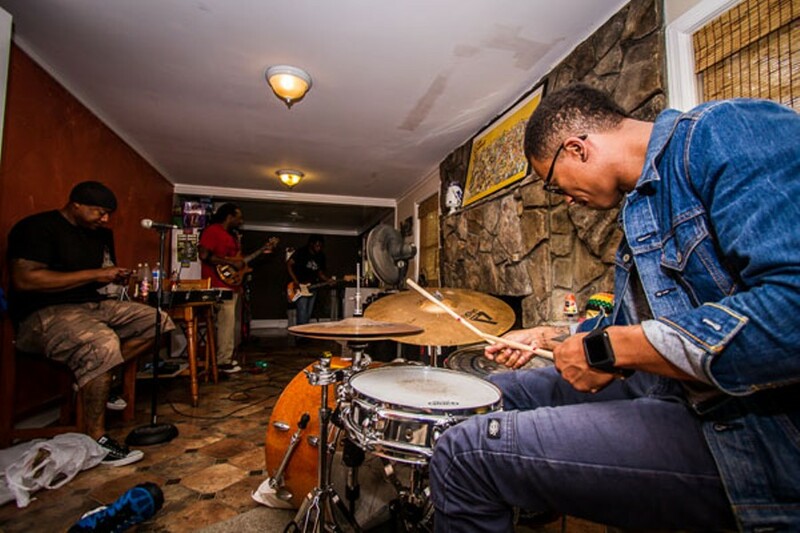 Jahmaar Stafford, who raps in fusion group Elenora Fagan, pens and performs the vocals and guitarist Cedric "Jupiter Jazz" Bracey fills out the lineup. Somehow, these diverse and disjointed parts add up to one surprisingly danceable, raucous, garage band whole. "The right group of guys got together," says Stafford. "We've known each other for years." The Braceys went to high school with Ovett, in Lancaster, S.C. Jerome played metal bass and Cedric played guitar, but, back then, they didn't know Ovett played drums. Years later, they reconnected in Charlotte and, in 2007, Jermaine and Ovett started making hypnotically chaotic music as the bass and drum duo Battle Beast. Battle Beast did its first show at Rat's Nest in NoDa and are building a steady following in Charlotte. A tour in New York made noise, as did massively distorted banger albums like Werewolf in a Blender. The group even went back and played Lancaster, melting faces at a rented booth in a county flea market. It got shut down by the third song, so the band packed up and played on Ovett's grandmother's porch. "That was an awesome day," Ovett says fondly. "They were stunned. There's hasn't been that much noise in Lancaster since." Elenora Fagan's frontman, Stafford, met Ovett and Bracey at a Milestone concert and they became fast friends. Battle Beast steadily performed, but after a few years other interests began to compete — visual art for Bracey, and Ovett started making glitchy, experimental spazz-rock as Death Rides a Horse. In 2013, Stafford came up with a "master plan" to get Battle Beast playing again — Start a(nother) rock band. "He was plotting on us," Ovett says with a laugh. "But the thing about Battle Beast is we can practice for weeks and weeks and weeks, or not practice for weeks and weeks, and when we come back together it's like no time has passed." It only took one phone call to get them all back together. Along with Stafford, Bracey brought in his brother Cedric on guitar and Harry Hunter was born. Named for Harold Hunter, the black pro skateboarder and actor (New Jersey Drive, Kids), the band plays with a sense of raw, unabashed fun. Unexpected twists keep mid-tempo melodies from flagging; songs like "Traintrack to Hell" and "Crossroads" feature driving beats and the bridge of "Stepping In" may leave you wanting a cigarette. Arch lyrics keep tension running throughout. On a bright Sunday inside a Plaza-Midwood bungalow, a life-size Batman cutout covers the door to the practice session. Ovett, Stafford and the Braceys are going over songs for the May 3 show. Though Jermaine is the acknowledged band leader, Ovett runs the practice session, keeping everyone's focus high. It's unclear why he has a roll of 10 or so drumsticks laid out next to his kit, until he counts off and lets go in a barely restrained fit. He's a monster on the drums. Halfway through the second song, the top half of one stick snaps clean off. He keeps banging out the beat with his right hand while grabbing another stick with his left. Their various degrees of splintering show a history of abuse, which is consistent with the ripples of sound still zinging around the room after the band finishes its flawless set. "I'm ready to make some noise that night," Cedric says.